Triangle patterns can help you to understand the current trend in any chart. They are essentially areas of consolidation and can help predict whether a trend is set to continue or reverse. In this article I’ll be looking at how to trade on technical triangle patterns. First we need to look at triangle patterns and atypical formations. 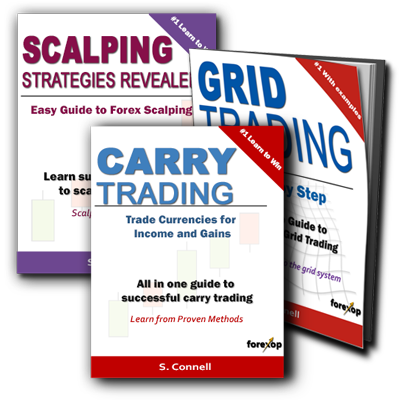 In the examples I am using a free triangle detector which you can download and try for yourself if you’re using MetaTrader. In most case triangles are a strong hint at continuation rather than reversal of the trend. However there are atypical cases that can warn you that reversal strength is building. Triangle are very similar in appearance to wedges and pennants. Wedges though are more steeply angled. Pennants also need to have a “mast”. 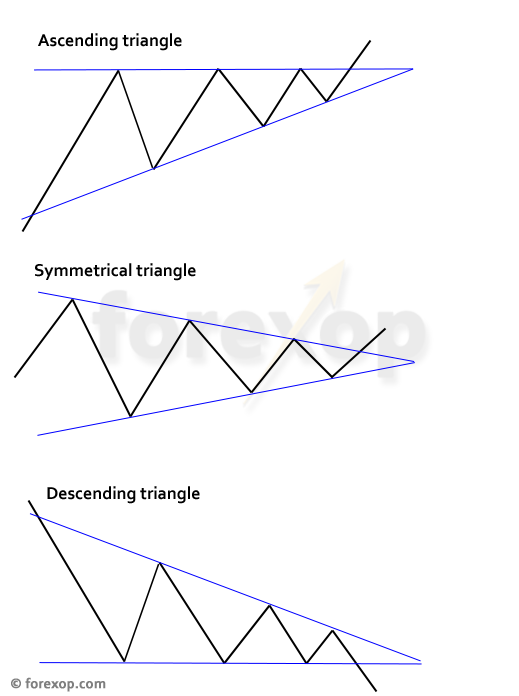 Triangles can appear at any time scale in forex, though chart traders will treat structures evolving over longer periods as more reliable. 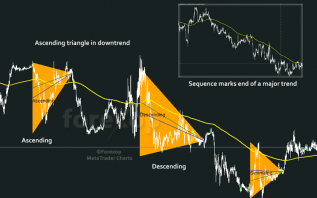 If you are using triangle patterns as a trade signal it’s important to look at the entire context: This means looking at the development of the trend up to the point that the triangle appears, and any groupings of triangle formations. Together these will help to differentiate a continuation pattern from a reversal pattern. I’ll look at this in more detail later. You’ll usually find triangle formations within trends, and often quite strong ones. The patterns mark out periods of consolidation. At these times, the progress of the trend has paused or may even reverse direction briefly. The characteristic pattern of a triangle is made when the highs made by the bulls converge to meet the lows made by the bears. These lines converge at the triangle’s tip. Triangles are areas in the chart where price volatility is shrinking – giving rise to a classic wedged shaped pattern. You’ll often see a strong price break out when the triangle pattern ends. When this happens, volatility rises again and the market begins a new leg. 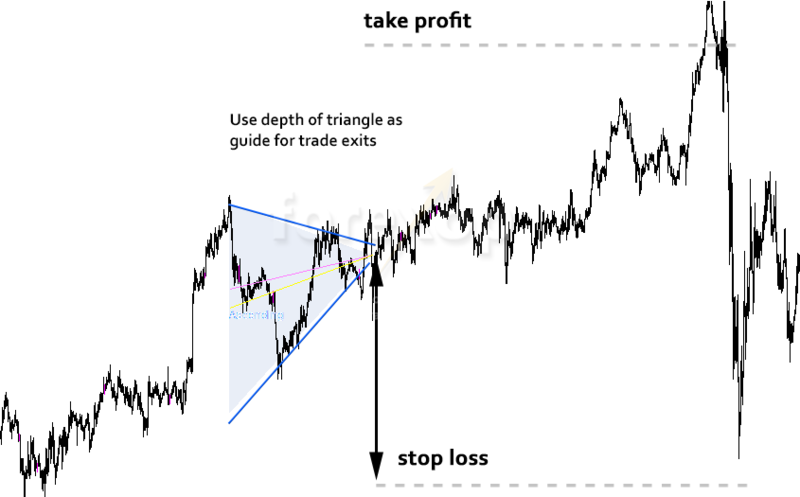 This breakout property means triangles can be profitable trading signals. The depth: This is the high to low price range within the triangle’s area. The orientation allows you to classify the triangle as symmetrical, ascending or descending. This helps determine the market’s likely future direction. The depth gives an idea of the overall size of the pattern and helps judge its significance. The flattest edge defines whether the configuration is ascending or descending (Figure 1). However you seldom find patterns that are entirely uniform, so I prefer to use the orientation. The type of triangle and how the patterns are clustering on the chart can give an important outlook on the market. For example, in an uptrend, a group of triangles with reducing orientation can be a sign that the trend is weakening in the current direction. When does a Triangle Predict a Trend Continuation? One thing most people ask is this: When does a triangle indicate a continuation and when does it suggest a reversal? Triangles mark periods of consolidation. It makes sense then that more often than not a triangle will point towards a continuation of the leading trend. As an example, the table below summarizes patterns found over a 4-year period on the USD/JPY fifteen minute (M15) chart. In this analysis, the break out immediately following the triangle was measured. The table shows that in 54.3 percent of the cases, a downward move of the market occurred just after a descending triangle appeared. Almost identically, 54.1 percent of ascending triangles were followed by an upward move of the market. 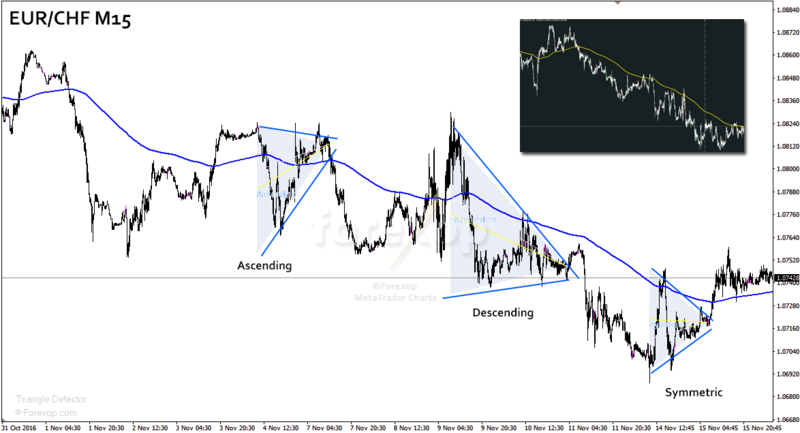 In the USD/JPY chart at least, triangle formations were indeed good predictors of trend continuation. The chart in Figure 2 shows an ascending triangle in an uptrend. Notice that the pattern itself occurs during a period when momentum is slowing. This is a classic triangle formation that marks a brief consolidation but not a trend reversal. It’s a pause. The trend does in fact break out strongly on the upside shortly after the pattern appears. The small box shows the scale of the triangle within the entire trend. Figure 3 shows a bearish scenario. Here two strong triangle patterns form in a downtrend. Notice that in both of these cases the triangle happens at or precedes slowed momentum. I’m measuring “momentum” here by the yellow line which is a long period moving average. It’s useful to use a moving average alongside triangles. This will outline the overall trend from the market’s noise. 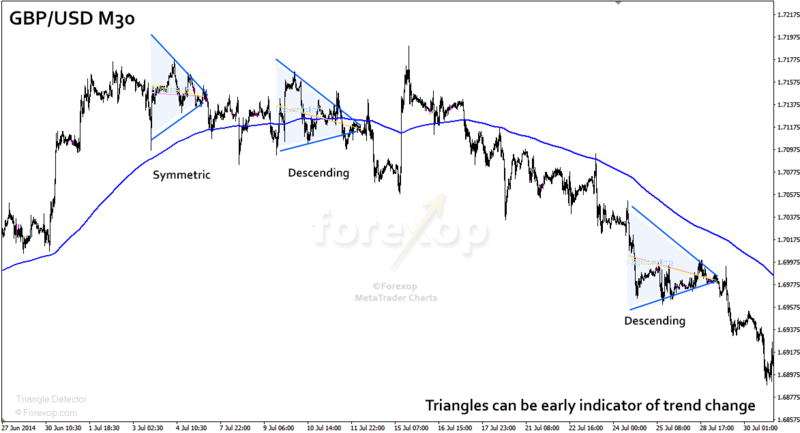 Triangles are valuable patterns for any form of trend trading. That means trading continuation of a strong trend. You can also use the appearance of a triangle and triangle groups to either increase or reduce your position. When trading an upward trend, you can add to your long position on the appearance of a strong ascending triangle. Likewise, you can add to your short position when a descending triangle appears in a downtrend. Remember the depth of the triangle is the range of the market’s price during the time the pattern was forming. The depth is a useful measure of volatility because it’s not averaged and is recent. You can use this as a rule of thumb for setting your take profit and stop losses for your trade. You can trade triangle events as single order trades or as a grid. For the stop loss it’s a good idea to have a margin at least below the bottom range of the triangle. The take profit should be a similar size. See Figure 4. This gives 90 pips leeway above and below the open level. You can set this to be more or less aggressive, according to your risk levels. You can also use triangle formations as an early predictor of trend change or trend weakening. Figure 5 shows a sequence of triangles that tell the story of a changing trend. The first pattern is a steep descending triangle. This is followed by a large symmetrical triangle as the trend bottom nears. Notice that the depth of the symmetric triangle is much greater than the two either side of it. This is common because volatility usually widens as the market approaches a trend bottom or trend top. At the time the symmetrical triangle appears, the long moving average line is still pointing towards continuation of the downward trend, though with some slowing. Finally a new ascending triangle appears in the direction of the upward move. This confirms that the trend has undeniably reversed. This would be the least risky time to go long. The most common case is for an ascending triangle to appear in uptrend and a descending triangle to appear in a downtrend. But this rule doesn’t always hold. Triangles can also appear the other way around. These are atypical or reverse cases. The atypical case: An atypical triangle is in reverse, meaning a descending triangle in an uptrend or an ascending triangle in a downtrend. Atypical triangles mark places where the price attempted a reversal but failed to carry through. You can use atypical cases to predict reversals in trend. See the examples below and Figures 7 and 8 for examples. A symmetrical triangle marks a consolidation period where the market isn’t driving in any preferred direction. The bulls and bears are evenly matched. Data shows these chart patterns to have slightly better than even odds at predicting a continuation (see results). They often form near or exactly at a trend top or trend bottom. This is why it’s important to take note of them when they appear. Unlike averaging filters, a triangle pattern can capture a great deal of information on the state of the market during that interval. The trend is weakening and is pending a reversal – at that instant bulls can’t push higher and bears can’t push lower. If a strong symmetric triangle appears in an uptrend, it’s best to reduce long positions. Likewise in a downtrend it’s best to reduce short positions. That is, treat the symmetric triangle as a potential for the trend to reverse. For example take a look at Figure 7. Here we have an ascending triangle appearing in a downtrend. It’s an atypical case being the wrong way around. This is followed by a strong descending triangle and then a symmetric one as the trend bottoms out. The first ascending triangle represents a failed upward breakout. The trend didn’t reverse at this point and turns downwards again for a short period. However the break shows that bullish strength is building at this point. The symmetric triangle shortly afterwards means that the trend has probably bottomed out and this would be a good point to go long. It’s best not to enter on a single “reversal triangle”. It’s better to wait for other confirming signals that the trend is indeed flipping direction. In this example it was the symmetric triangle and the market already being in a deeply oversold state. In this example a reversal triangle hints at the end of an uptrend. Figure 8 shows a similar development to the case above. The descending pattern forms as an uptrend is nearing exhaustion. Again this atypical triangle is a failed downside breakout attempt where bears are gaining strength but not enough to control direction. Shortly afterwards a big symmetric triangle forms on high volatility. This is a strong clue that the current uptrend is nearing completion. A short position placed immediately after the pattern would capture the large downside break just afterwards. More on the triangle/wedge indicator. Thanks. In the analysis is there any way to clarify which to use as a reversal setup and those which don’t warn on a new trend? Does this indicator tell the difference between them or that still has to be done by human users? Just to be clear I am eur/usd day trader.. have just started using some TA methods. Do you wait for the candle to close before you enter in the market or it is just a break thru the support? I used the triangle trade as a near perfect setup for a while now. Like you say the difference between the reversal and continuation type in the chart is quite subtle, it has to be learned. How do you know which of these to trade and which you ignore? Or you trade them all if in a trend or not? Once you know the appearance they are easier to find in the chart. Discipline is what we need the most in trading these. thanks.